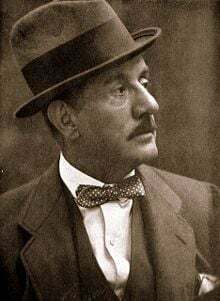 Giacomo Antonio Domenico Michele Secondo Maria Puccini (December 22, 1858 – November 29, 1924) was an Italian composer whose operas, including La Bohème, Tosca, Madama Butterfly, and Turandot, are among the most frequently performed in the history of the genre. Some of his melodies, such as O mio babbino caro from Gianni Schicchi and Nessun Dorma from Turandot, have become standards in common culture. One of the few operatic composers to successfully use both German and Italian techniques of opera, Puccini was, in Italian opera, the only true successor of Giuseppe Verdi. After Verdi, the sentimental "realistic" melodrama of the 'verismo' style was introduced in Italy by Pietro Mascagni's Cavalleria Rusticana (Rustic Chivalry) and Ruggiero Leoncavallo's Pagliacci (Clowns). Verismo subsequently gained a near total dominance of the world's opera stages with Puccini's La Boheme, Tosca, and Madama Butterfly playing a major role in such development. Born into a musical family strongly tied to the Christian tradition, Puccini served as a church organist and choir director until he was inspired to become a composer of operas when he heard a performance of Verdi's "Aida." Although he started by composing religious music, his operas have secular subjects and deal with very realistic situations. In his works he visits the Rome of Tosca, Bohemian life in Paris, the shores of Japan in Madama Butterfly, the China of Turandot, and even the bayous of Louisiana in Manon Lescaut. With their universal subject matter that captures a global interest, Puccini's best operas have become true classics. Puccini was born in Lucca in Tuscany, Italy, into a family with a long history of music. Only five years old when his father died, the boy was then sent to study with his uncle Fortunato Magi, who considered him a poor and undisciplined student. Later, Puccini took the position of church organist and choir master, but it was not until he saw a performance of Giuseppe Verdi's Aida that he became inspired to be an opera composer. He and a friend walked a 18.5 miles (30 kilometers) to see the performance in Pisa. In 1880, Puccini traveled to the Conservatory of Music in Milan to begin his career by studying composition with Amilcare Ponchielli. In 1880, at the age of 21, Puccini composed the Messa that marks the culmination of his family's long association with church music. Although Puccini himself correctly titled the work a Messa, referring to a setting of the full Catholic Mass, today the work is popularly known as his Messa di Gloria, a name that technically refers to a setting of only the first two prayers of the Mass, the Kyrie and the Gloria, omitting the Credo, the Sanctus, and the Agnus Dei. Puccini's work is, in fact, a Messa. The work anticipates Puccini's career as an operatic composer by offering glimpses of the dramatic power that he would soon unleash on the stage; the powerful arias for tenor and bass soloists are certainly more operatic than is usual in church music. The Messa, in its orchestration and drama, exists on a par with Verdi's Requiem. From 1880 to 1883 he studied at the Milan Conservatory under Amilcare Ponchielli and Antonio Bazzini. In 1882 Puccini entered a competition for a one-act opera. Although he did not win, Le Villi was later staged in 1884 at the Teatro dal Verme; it also caught the attention of Giulio Ricordi, head of G. Ricordi & Co. music publishers, who commissioned a second opera, Edgar (1889). From 1891 on, Puccini passed more of his time at Torre del Lago, in the Tuscan countryside on the border of Lake Massaciuccoli. He hunted and found refuge from the crowded city. By 1900 he had acquired land and built a villa on the lake, now known as the Villa Museo Puccini and presently owned by his granddaughter Simonetta Puccini. He lived there until 1921 when he moved to Viareggio, a few kilometers north. A habitual cigarette smoker, Puccini began to complain of chronic sore throats toward the end of 1923. After a diagnosis of throat cancer, he underwent a new and experimental treatment called radiation therapy, which was being offered in Brussels, Belgium. He and his wife never knew about the seriousness of the cancer, as the news was only revealed to his son. Puccini died there on November 29, 1924 from complications from the treatment. News of his death reached Rome during a performance of La Bohème. The opera was immediately stopped, and the orchestra played Frédéric Chopin's Piano Sonata No. 2 in B flat Minor Funeral March for the stunned audience. He was buried in Milan, but in 1926 his son ordered the transfer of his father's remains to the chapel in his house at Torre del Lago where he still lies together with his wife and son. His villa in Torre del Lago is now owned by his granddaughter, Simonetta Puccini, and is open to the public. La Bohème (1896) is considered one of his best works as well as one of the most romantic operas ever composed. It is arguably today's most popular opera. 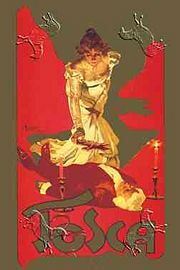 Tosca (1900) was arguably Puccini's first foray into musical verisimo, the realistic depiction of life including, in this case, violence. The opera is generally considered of capital importance in the history of opera because it contains many high points. Madama Butterfly (1904) was greeted with great hostility (mostly orchestrated by his rivals) but, after some reworking, became another of his most successful operas. Composition was slow after this. In 1903 Puccini was injured in a near-death automobile accident. In 1906, Giuseppe Giacosa died. In 1912, Puccini's editor, Giulio Ricordi, who had a very important role in the rising of his career, also died. 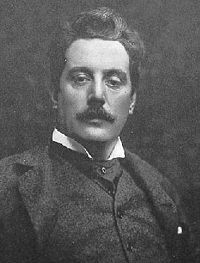 Nonetheless, in 1910, Puccini completed La fanciulla del West, which he later on thought of as his most powerful opera, and, in 1917, finished the score of La rondine, a piece he reworked from an operetta he had attempted to compose only to find that his style and talent were incompatible with the genre. In 1918 Il Trittico premiered in New York. This work is composed of three one-act operas: a horrific episode (Il Tabarro), in the style of the Parisian “Grand Guignol,” a sentimental tragedy (Suor Angelica) and a comedy or farce (Gianni Schicchi). Of the three, Gianni Schicchi is the most popular, and contains the aria O mio babbino caro, which is extremely popular and a favorite among opera fans. Puccini’s death marked the end of opera as a popular art form. Turandot, his last opera, was left unfinished. The last two scenes were completed by Franco Alfano. When the opera was premiered by Toscanini, in front of a sold out crowd with every prominent Italian in attendance (the exception being Benito Mussolini), he had chosen not to perform the score by Alfano. The performance progressed to the last measures that Puccini himself completed and orchestrated, at this point, the orchestra stopped, and the performers froze in position. Toscanini turned to the audience and said: "Here the opera finishes, because at this point the Maestro died." In 2001 an official new ending was composed by Luciano Berio from original sketches but this finale is performed infrequently. In terms of politics, Puccini was nearly invisible, unlike Wagner (anti-semitism) and Verdi (Risorgimento). However, Mussolini, fascist dictator of Italy at the time, claimed that Puccini requested admission into the National Fascist Party in Italy. This is highly unlikely. There are no records or proof of any form of request by Puccini. As well, one can note that had Puccini done so, his close friend, Arturo Toscanini, who was extremely anti-fascist, wouldn't have been as friendly and warm to Puccini as he was. Mussolini probably made this claim to gain support from the people. Puccini's style has been one long avoided by musicology|musicologists, perhaps due to its complexity. His style of orchestration shows the strong influence of Wagner, as it is heavily integrated and dramatic, having the power and variety to move the plot as if it were a character. His operas contain an unparalleled manipulation of orchestral colors. The orchestra often characterizes the scene or setting's atmosphere. For example, the orchestra at the end of Madama Butterfly reflects the tragedy of Cio-Cio-San's love, the orchestra at the close of Act I of La Bohème describes the love of Rodolfo and Mimi, and the orchestra throughout Act II of Tosca depicts the tensions between Tosca and Scarpia, as well as tragedies (torture of Cavaradossi and Tosca's resort to murder) and Scarpia's evil. At the beginning of Act III of the same opera, Puccini even creates a sense of the atmosphere during dawn in a pastore. One can feel the sun rising, the ringing of bells from churches and monasteries. Madama Butterfly contains an effect similar to Tosca's dawn in a pastore; after the Intermezzo in Act II, one can hear the rising of the sun, the peace of the early morning, the chirping of birds, and most remarkably, Cio-Cio-San's excitement for the return of Pinkerton. The structures of Puccini's works are also unique. It is somewhat possible to divide his operas into arias or numbers, like Verdi, but for the most part his operas give a very strong sense of continuous flow and connectivity like Wagner’s. Also like Wagner, Puccini used leitmotifs' to characterize characters. This was extremely apparent in Tosca, where the three chords which signaled the beginning of the opera were used throughout the opera to describe the character and presence of Scarpia. Several motives were also attached to Mimi and the Bohemians in La Bohème and Cio-Cio-San's eventual suicide in Madama Butterfly. Unlike Wagner, though, Puccini's motives are static—they sound identical throughout the opera. Wagner's motives develop into more complicated figures as the characters develop. Another distinctive quality in Puccini's works is the use of the voice in style of speech. In his operas, characters sing short phrases one after another, as if they were talking to each other. However, of course, Puccini has many melodies in his operas, and they are very easy to recognize and remember. This is because Puccini's melodies are often conjunct melodies: melodies that are created through small jumps in the scale, like nursery rhymes. As well, Puccini's melodies are often made of sequences from the scale. Very distinctive examples of this are Quando me'n vo (Musseta's Waltz) from La Bohème and E lucevan le stelle from Act III of Tosca. It is a rarity not to find at least one Puccini aria in an operatic soprano or tenor single album/recital; the same can be said for perhaps the only other notable composer in opera: Giuseppe Verdi. Although Puccini is mainly known for his operas, he also wrote some orchestral pieces, sacred music, chamber music and songs for voice and piano. Turandot, left unfinished in 1924 by the time of the composer's death, it was premiered in 1926 in a version completed by Franco Alfano. Puccini, Simonetta (ed.). 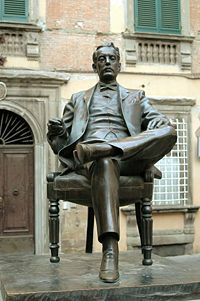 Giacomo Puccini in Torre del Lago. Viareggio, Tuscany: Friends of Giacomo Puccini's Houses Association, 2006. This page was last modified on 21 June 2017, at 16:39.